MANILA, Philippines — The governments of the Philippines and Chile on Monday agreed to pursue a possible free trade agreement, signing a letter of intent on a joint feasibility study. In a joint press conference with Chile President Michelle Bachelet, President Benigno Aquino III said both sides have agreed to develop a framework for a "mutually beneficial trade agreement." 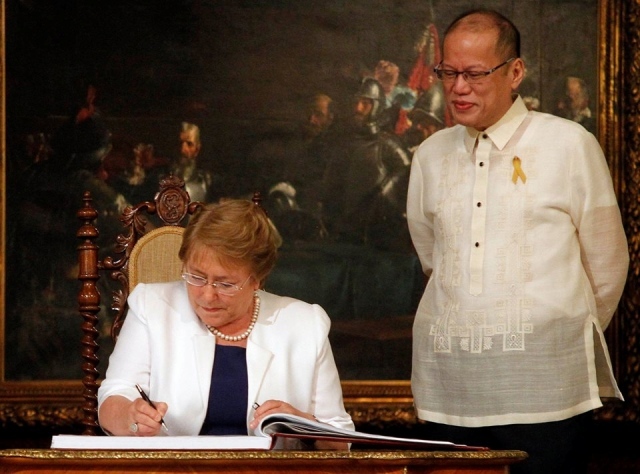 Aquino and Bachelet witnessed the signing of the letter of intent by Trade Secretary Gregory Domingo and Chilean Foreign Affairs Minister Heraldo Muñoz to signal the start of discussions on the possible deal. "Through this, we mandate the Department of Trade and Industry of the Philippines and the General Directorate for International Economic Relations of Chile to continue talks in 2016," Aquino said. A free trade agreement is seen to contribute to an increase in trade, goods and investments, and the promotion of technical cooperation in areas of mutual interest between Chile and the Philippines. "The Philippines and Chile have enjoyed warm relations for almost 70 years: relations founded on a shared history, and commonalities in faith, tradition, culture and values. Our gathering today is indicative of our shared desire to advance this partnership," Aquino said. Bachelet, meanwhile, said her state visit "has been an excellent opportunity to deepen ties and to establish a substantial work agenda in bilateral areas." "In the bilateral area, Chile and the Philippines are seeking to promote and diversify trade, and because of that, we are initiating talks regarding free trade agreement," she said. Bachelet arrived in Manila on Sunday for a historic state visit and visited the Rizal Monument in Manila on Monday morning to lay a wreath in honor of Filipino hero Jose Rizal. Manila Mayor Joseph Estrada accompanied the Chilean leader during the ceremony. The 64-year-old Bachelet, the first woman to be elected president of her country, timed her trip to the country to coincide with the 27th Asia-Pacific Economic Cooperation Leaders' Summit on Wednesday.